Monday Memos: RawSpiceBar…the subscription box service that you NEED this year! Home | Monday Memos | Monday Memos: RawSpiceBar…the subscription box service that you NEED this year! Hello people of the internet!!! On today’s `Monday Memos’ we’re going to discuss an AMAZING subscription box that y`all should all check out this holiday season! 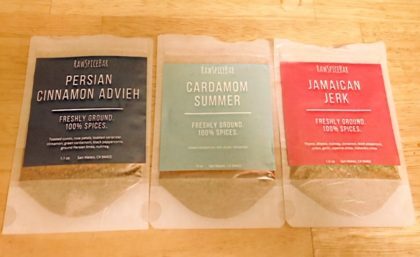 If you like trying exotic new dishes (or just want to impress your friends by how fancy you are) then the RawSpiceBar subscription service is for you. As you know, I never promote any band, artist, book, or product that I do not 100% believe in. I tried RawSpiceBar for the 1st time last year & I absolutely loved their service. Because of this experience I`m so happy to say that I have once again partnered with RawSpiceBar to bring you guys all the information you need to spice up your Thanksgiving, Christmas, or any other special event you have planned for this holiday season. I did receive this product for free to review, however once again this did not affect my opinion of the product itself. Now let’s get to the review! Ready? Ok, let’s go!!! 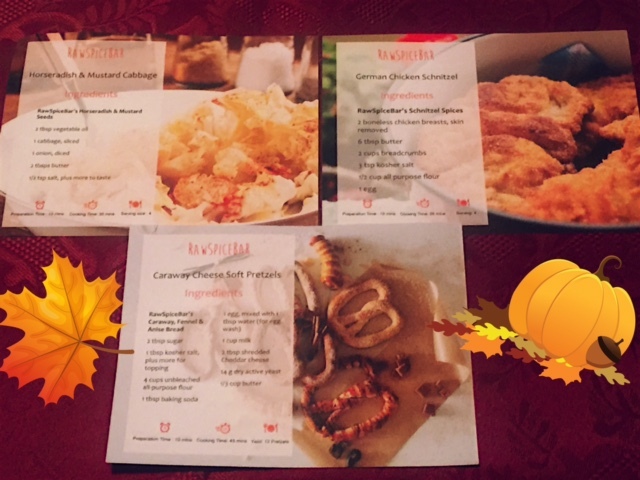 I received the October kit which had an Oktoberfest themes inspired by German spices! This kit included the following spices & accompanying recipes: Horseradish & Mustard Seed (which included a recipe for Horseradish & Mustard Cabbage), Caraway, Fennel & Anise Bread (which included a recipe for Caraway Cheese Soft Pretzels), and lastly Schnitzel Spices (which included a recipe for German Chicken Schnitzel). The Horseradish & Mustard Seed spice had a very earthy, fresh taste that really gave the Horseradish & Mustard Seed Cabbage a unique taste that made me want to add it as a usual dinner item. The Caraway, Fennel & Anise Bread was definitely my favorite of the spices because the Caraway Cheese Soft Pretzels were super delicious. If you want mall level pretzels then you have to give this recipe a try. Lastly (but DEFINITELY not least) we have the Schnitzel Spices for the super yummy German Chicken Schnitzel. This dish was a little spicy, but the crunchy exterior and juicy interior really made the dish standout among common chicken dishes. I bet you’re hungry now right? Well have no fear people of the internet because I have your solution! First I have a question for you. What’s better than awesome food? Give up? Awesome food at a discount! So here’s what you do. 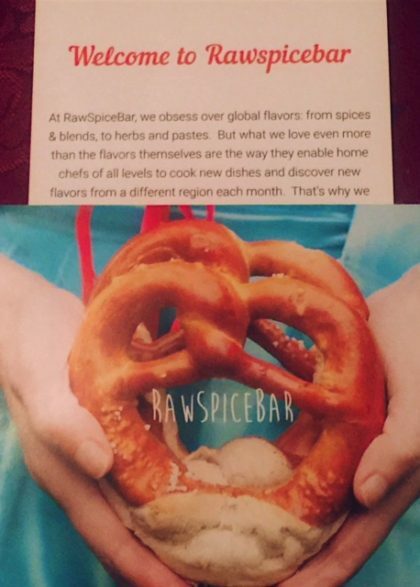 Go to www.rawspicebar.com, create your flavor profile (where you can describe your dietary needs RawSpiceBar can pick the right recipes & flavors for you), customize your fav recipes & flavors, then decide if you want a 6 month subscription (only $7 a kit) or a 12 month subscription (only $6 a kit). To make this deal even more awesome the box ship for free & you can $5 off your first month by using the code FLAVOR6! Amazing right? So whether you get your RawSpiceBar subscription for you or as a gift for the special chief in your life, you can’t go wrong with this AMAZING offer! celindareyesblog November 15, 2016 No Comments on Monday Memos: RawSpiceBar…the subscription box service that you NEED this year!. Category: Monday Memos. Tagged: 2016, 2017, amazing, Box, Chef, christmas, collab, Cook, Fest, food, fun, holiday, Kit, new, RawSpiceBar, review, season, spice, subscription, thanksgiving. Hello people of the internet!!! With summer quickly coming to an end (insert sad face), we will soon say hello to all of our favorite things about fall, such as: warm sweaters, all of the holidays were we eat things that we will regret in the spring, pumpkin spice everything, and FALL TV! So to celebrate, on today’s ‘Monday Memos’ we are going to discuss 3 new shows that will be hitting our TVs this fall. that you CAN’T miss out on (on a side note, by the time I post this blog 1 of the shows will have already premiered, also I didn’t mean to only feature shows that will begin in September, it just sort of worked out that way). Ready? Ok, let’s go!!! In this show, we will see the everyday lives of The Muppets as they struggle to balance their personal and professional lives. We will also see all of the drama that happens behind the scenes as The Muppets produce the late night show ‘Up Late with Miss Piggy’. This show is going to be a parody of a mockumentary (which is a fake documentary style show such as The Office or Modern Family), and will definitely feature A LOT of drama and comedy. It has been said that this show will have a morn “grown up” flair to it that new and old fans will definitely love. Personally I can’t wait to see the drama that unfolds between Kermit and Miss Piggy after their breakup this summer (oh the drama!). 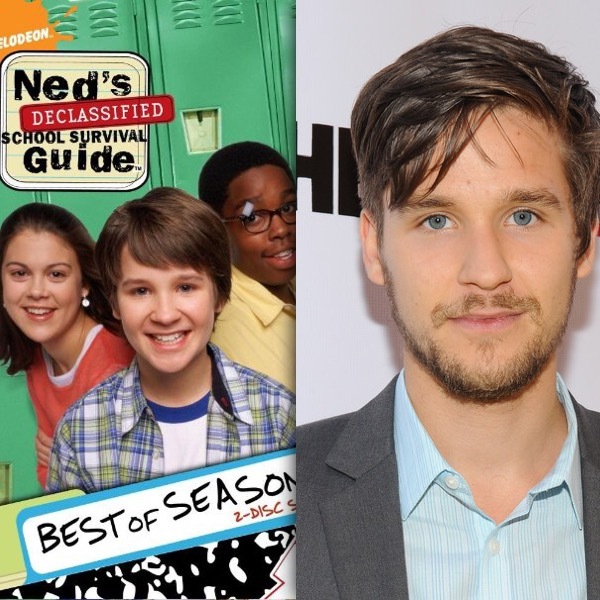 This new Nickelodeon show is sure to be a hit with kids and those who are still kids in their hearts. 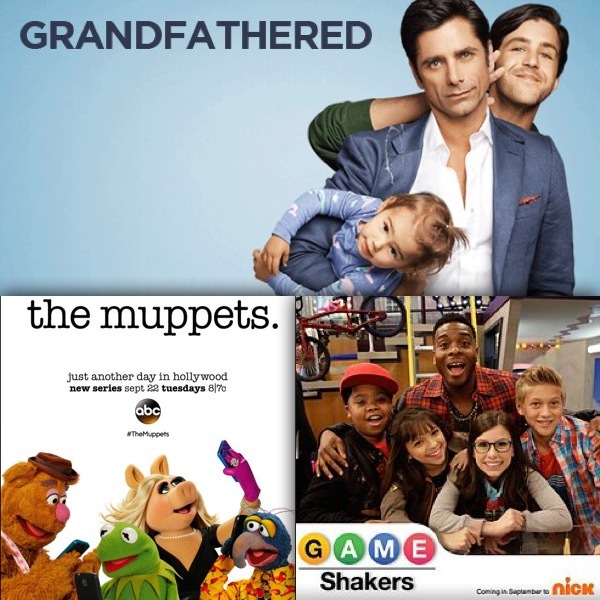 Game Shakers is the newest show from veteran hit maker Dan Schneider who previously brought us: All That, Kenan and Kel, Drake and Josh, iCarly, and so many more. This show is about two BFFs named Babe and Kenzie, who create a video game app for a school science project, and from this start a successful gaming company. Along the way they get their best friend Hudson to serve as their test dummy, and receive an investment from a successful rapper known as Double G. This show is going to include guest starring spots from various YouTubers and some stars from Dan Schneider’s other shows, and will co-star Kel Mitchell from Kenan and Kel (which older fans will fangirl/fanboy over). This show stars John Stamos who is a recently divorced restaurant owner who finds out that he has a son (Josh Peck) he never knew about, and even more surprising, a granddaughter. This will definitely be a comedic sitcom that will have everyone talking. Personally I’m really excited to see Josh Peck (who we loved from Drake & Josh) and John Stamos’ comedic talents collide. This is definitely a show we will be talking about all fall. All credit goes to The Muppets, Bill Prady, Bob Kushell, Randall Einhorn, Steve Whitmire, Eric Jacobson, Dave Goelz, Bill Barretta, David Rudman, Matt Vogel, Peter Linz, Kyle Laughlin, Debbie McClellan, ABC Studios, The Muppets Studio, Bill Prady Productions, Disney-ABC Domestic Television, Rick Gervais, Stephen Merchant, Greg Daniels, Howard Klein, Ben Silverman, Paul Lieberstein, Jennifer Celotta, B. J. Novak, Mindy Kaling, Brent Forrester, Dan Sterling, Deedle-Dee Productions, Reveille Productions, Shine America, NBC Universal Television Studios, Universal Media Studios, Universal Television, NBCUniversal Television Distribution, NBC,Modern Family, Christopher Lloyd, Steven Levitan, Jeffrey Morton, Paul Corigan, Dan O’Shannon, Brad Walsh, Danny Zuker, Bill Wrubel, Jeffrey Richman, Abraham Higginbotham, Chris Smmimoff, Elaine Ko, Sally Young, Becky Mann, Audra Sielaff, Lloyd-Levitan Productions, Picador Productions, Steven Levitan Productions, 20th Century Fox, 20th Television, Eric Jacobson, Frank Oz, Dan Schneider, Cree Cicchino, Madisyn Shipman, Benjamin Flores Jr., Thomas Kuc, Kel Mitchel, Nickelodeon Productions, Nickelodeon, Brian Robbins, Mie Tollin, Joe Davola, Kevin Kopelow, Heath Seifert, Tollins/Robbins Productions, Schneider’s Bakery, Kim Bass, Bass Entertainment, Robin Weiner, Joe Catania, Bruce Rand Berman, MTV Networks International, Jake Farrow, Matt Fleckenstein, Arthur Gradstein, John Stamos, Josh Peck, Grandfathered, Daniel CHun, Chris Koch, Dan Fogelman, all of the businesses, companies, people, and any other original owners involved and/or mentioned that should receive credit for anything mentioned in this blog post, and all original owners. I do not own anything in this blog. If any people, corporations, businesses, companies, etc, were not previously given credit for their work, they are given credit now and their previous absence was unintentional. All opinions expressed in this blog are my own. I wrote this blog for entertainment purposes and no copyright infringement is intended. celindareyesblog September 15, 2015 No Comments on Monday Memos: Fall shows you can’t miss. Category: Monday Memos. Tagged: 2015, 2016, 20th Century Fox, 20th Television, ABC Studios, Abraham Higginbotham, Arthur Gradstein, Audra Sielaff, B. J. Novak, Bass Entertainment, Becky Mann, Ben Silverman, Benjamin Flores Jr., Bill Barretta, Bill Prady, Bill Prady Productions, Bill Wrubel, Bob Kushell, Brad Walsh, Brent Forrester, Brian Robbins, Bruce Rand Berman, Chris Koch, Chris Smmimoff, Christopher Lloyd, Cree Cicchino, Dan Fogelman, Dan O'Shannon, dan schneider, Dan Sterling, Daniel CHun, Danny Zuker, Dave Goelz, David Rudman, Debbie McClellan, Deedle-Dee Productions, Disney-ABC Domestic Television, Elaine Ko, Eric Jacobson, fall, Frank Oz, Grandfathered, Greg Daniels, Heath Seifert, Howard Klein, Jake Farrow, Jeffrey Morton, Jeffrey Richman, Jennifer Celotta, Joe Catania, Joe Davola, john stamos, Josh Peck, Kel Mitchel, Kevin Kopelow, Kim Bass, Kyle Laughlin, Lloyd-Levitan Productions, Madisyn Shipman, Matt Fleckenstein, Matt Vogel, Mie Tollin, Mindy Kaling, Modern Family, movie, MTV Networks International, nbc, NBC Universal Television Studios, NBCUniversal Television Distribution, new, nickelodeon, Nickelodeon Productions, Paul Corigan, Paul Lieberstein, Peter Linz, Picador Productions, Randall Einhorn, Reveille Productions, Rick Gervais, Robin Weiner, Sally Young, Schneider's Bakery, season, Shine America, show, Stephen Merchant, Steve Whitmire, Steven Levitan, Steven Levitan Productions, The Muppets, The Muppets Studio, Thomas Kuc, Tollins/Robbins Productions, tv, Universal Media Studios, Universal Television. Hello people of the Internet!!! On today’s ‘YouTube Wednesday’ we are going to discuss another AMAZING YouTuber that y’all will soon have to subscribe to!Who are we talking about? I’m glad you asked! If you haven’t heard of Hannah aka MissInnerBeauty2 then y’all need to jump on the bandwagon. Trust me you’ll love her! Hannah’s beauty/fashion/fitness tips & tricks will help you feel beautiful from the inside out by showing you that confidence is always in style. So now let’s move on to the videos. Ready? Ok, let’s go! The first video that we’re going to talk about is Hannah’s ‘My Top 10 Spring Essentials’ video, which was uploaded on May 13th, 2013. Personally I love looking at a YouTuber’s first video because it not only shows how they have grown as YouTubers, but also as people. I thought that this was an AWESOME debut video because it showed that Hannah is knowledgeable about what she’s talking about, and also has a fun personality that jumps off the screen. This is also the perfect video for anyone who is new to the beauty world. Ok, the next video that we’re going to talk about is Hannah’s ‘Naked Pallets Comparison: 1,2,3 and Basics! 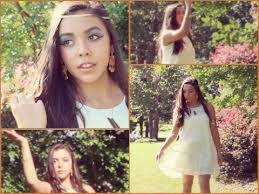 Urban Decay’ video, which was uploaded on January 7th, 2014 (you can check out the video below). I thought that this was such a great at video for Hannah’s viewers, and it just really impressed me. If you’ve wanted to buy any of these pallets, but haven’t because you couldn’t decide which one you wanted and/or you didn’t want to spend the money to buy more than one of the pallets, then this is the video for you. Once again Hannah shows that she is a natural on camera, and really knows what her audience wants to see. Next up we have another AMAZING Hannah video! This is a ‘Blair Waldorf Back To School Makeup + Hair Gossip Girl’ video, which was uploaded on July 15th, 2014 (you can check out the video below). Now I think that we can all admit that the characters on ‘Gossip Girl’ had the best style ever and Blair is definitely a HUGE fan favorite because of this very reason. Blair had the perfect mix of preppy and girly, and just seemed so perfectly put together, that we couldn’t help but wish we could all look that awesome every day. Hannah is able to perfectly replicate this character’s signature fashion and beauty style, which shows us that Hannah’s videos will just continue to amaze us. Now even though we could sit here all day and talk about all of Hannah’s videos (which trust me I would LOVE to do), I can’t keep y’all here all day, so let’s talk about our final Hannah video. Ok, the last video that we’re going to talk about is Hannah’s ‘FabFitFun First Impressions Unboxing’, video which was uploaded on April 11th, 2015. I thought that this was another really cool video, because this service delivers a box every season with beauty products/health products/and exercise products. I hadn’t heard of this specific service before so I thought that the company had a really interesting concept. I really loved how Hannah seemed very honest about her review of what was in the box, which definitely makes us love her even more. In this video Hannah shows that she is very comfortable in front of the camera, and is able to make you feel like you’re talking to one of your friends, which is definitely the sign of a YouTube star in the making. All credit goes to Hannah, MissInnerBeauty2, YouTube, Twitter, Tumblr, Gossip Girl, Blair Waldorf, FabFitFun, Urban Decay, Urban Decay Naked Pallet 1, Urban Decay Naked Pallet 2, Urban Decay Naked Pallet 3, Urban Decay Naked Pallet Basics, all companies, individuals, corporations, products, music, or copyrighted material used in the videos mentioned in this blog post, and all companies, individuals, corporations, managers, record labels, writers, producers, and/or businesses that should receive credit for anything mentioned in this blog post, and all original owners. I do not own anything in this blog. If any people, corporations, businesses, companies, etc, were not previously given credit for their work, they are given credit now and their previous absence was unintentional. All opinions expressed in this blog are my own. I wrote this blog for entertainment purposes and no copyright infringement is intended. celindareyesblog April 22, 2015 No Comments on YouTube Wednesday: MissInnerBeauty2…the beauty guru you will be addicted to this Spring. Category: YouTube Wednesday. Tagged: amazing, beauty, Blair Waldorf, FabFitFun, fall, fashion, gossip girl, Hannah, internet, MissInnerBeauty2, new, season, spring, summer, tumblr, twitter, urban decay, Urban Decay Naked Pallet 1, Urban Decay Naked Pallet 2, Urban Decay Naked Pallet 3, Urban Decay Naked Pallet Basics, video, vlog, vlogger, winter, youtube.